Set of 12 Heavy Canvas Tote Bags Grocery Shopping, Art & Crafts Assorted Colors by ToteBagFactory at Designers Artists. Hurry! Limited time offer. Offer valid only while supplies last. This colorful shopping tote bag holds more than a standard paper grocery bag. 100% recycled natural cotton canvas for eco-friendly grocery shopping. This colorful shopping tote bag holds more than a standard paper grocery bag. 100% recycled natural cotton canvas for eco-friendly grocery shopping. 21" sturdy over-the-shoulder straps allow for convenient grocery carrying. Reusable grocery tote bags are perfect for everyday shopping, and you can take it for school, work, travel, or various activities as your everyday bag. Also great option for hobbies, DIY, arts & crafts projects, decorations. People can take it as grocery shopping bag, meanwhile, it can be used for promotion giweaways, trade shows, conference. Some young people even shouldering it walking in the street as a fashion, while some companies will take it to pack their products like clothes, baby items, toys, books etc. Great for decorating as a kids actvity craft project, or silkscreen imprinting. Set includes 12 pieces of assorted color heavy canvas tote bags. This reusable sturdy tote bags are made of 100% cotton canvas fabric. The tote bags are biodegradable, reusable, biodegradable, and recyclable. 12 oz heavy duty cotton canvas tote bags come in 12 different color. 21" self-fabric handles providing high quality and durability so you can comfortably carry by hand or over your shoulder. This reusable tote bags are made of heavy canvas material, with reinforced stitching at the stress points for maximum durability. 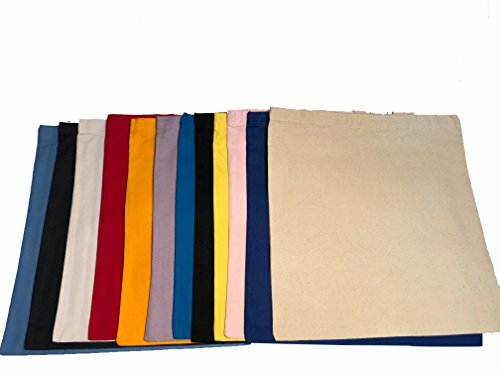 Eco-Friendly blank tote bags for grocery shopping, school, work, travel, gym, beach, church, custom DIY, art & crafts, decorations, weddings. Design your own customized tote bags to boast to recipients that this promotional use these as trade show giveaways and special event items. Product Size: 15"W x 16"H, Imprint Area Size: 10"W x 12"H. Great for promotional needs, giveaways, advertising your business, trade shows. It has a large imprint area for your logo, slogan, event, date or other information to be silkscreen printed or embroidered on. View More In Gift Wrapping Supplies. If you have any questions about this product by ToteBagFactory, contact us by completing and submitting the form below. If you are looking for a specif part number, please include it with your message.